Spring Break- Family groups only. Set on the southern tip of Texas, South Padre Island boasts Laguna Madre Bay to the West and the Gulf of Mexico to the East, giving you incredible beach access and an endless array of things to do. From simply relaxing in the sun and taking in the scenery, to fishing, boating and more. Off the water and out of the sun, South Padre is equally engaging. Shopping, a vibrant nightlife and dining scene all ensure you will have the time of your life. 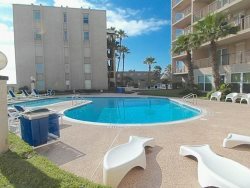 A great location, magnificent weather and endless things to do, South Padre Island is undeniably one of the most fun-filled vacation resorts anywhere. Maximum Occupancy: The maximum number of guests is limited to 8 persons in 3 bedroom units and 6 guests in 2 bedroom units. This is strictly enforced at the lobby desk. No Additional guests allowed. Note: Mini starter sets are provided... IMPORTANT: It is important to note that the kitchen is fully equipped. Please bring any additional supplies and items you may want to make sure to have during your vacation; kitchen & bath soap, extra paper towel and tissues, paper plates, paper napkins solo cups etc. Make sure to bring electronic devices, music, and gaming, computers and video to TV cables are great and dvd movies. Major Credit Cards accepted sorry no AMEX.